Another day, another few leaks about what to expect from the Motorola Moto X. This time around, we're getting more info on what to expect from the hardware and build quality of the device. This info comes again from Taylor Wimberly who has already put out info claiming that the Moto X would have options to have wood, metal, or ceramic backplates. Mr. Wimberly is very confident with his info, but right now, he is still a source of rumor and not fact. This time around, Mr. Wimberly is saying that the Moto X will be built with something called Moto Magic Glass, which is a single layer of Gorilla Glass that has been molded to a special polymer. This, combined with zero-gap construction, will make the device feel as though the display is a continuous surface that wraps around the entire front and edges of the phone, and make the back of the device feel smooth and seamless. Additionally, the Moto X allegedly is made with a laminated aluminum structure, which makes for a lightweight, but very strong design. And, it may feature 5 antennas: 2G/3G main, GPS, Bluetooth/Wi-Fi, and Dual LTE MIMO Smart Antennas which would offer faster LTE and better reception. As usual, it all sounds great, but we'll have to wait and see how much is accurate when the official word comes next week. So who can explain WTF Dual LTE MIMO is besides being the ridiculous marketing term? Dual LTE MIMO antennas are used in LTE Advanced for VOLTE (Voice over LTE). An LTE Advanced device has to have dual LTE MIMO antennas as one is receiving the data stream while the other is sending data from the device to the tower. If this rumor is true this device should be able to have a data streaming speed of 150 Mbps which is truly fast compared to the devices of today. thanks for the explanation...even though I didn't ask. Wrong. Every LTE device on the market EVER had two antennas, LTE main and LTE diversity. WTF is Dual MIMO other than marketing crap. All LTE smartphones on the market have been 2x2 MIMO on the Downlink and 1x2 SIMO on the uplink. Cat 3 or 4 baseband processor is incapable of processing more than 2x2 MIMO leveraging spatial multiplexing. Category 5 should be able to support Higher order MIMO like 4x4 which is due end of next year or 2015. So no... Even Galaxy S4 LTE-A doesn't market that phone as "Dual LTE MIMO" because it's mandatory for every phone to have two LTE antennas. I would like to remind you that dual LTE antenna setup is required for Release 8 operation on the downlink UE side. It's been in use on virtually every phone since HTC Thunderbolt 2 years ago. Go ahead and open any FCC filing of your choice on any LTE device, and you'll find LTE main and LTE diversity. Baseband processor isn't capable of processing more than TWO spatial streams, and having two times the amount LTE antennas (4) would be redundant in terms of throughput. So no... Also, to prove that it's all marketing, look at Samsung GS4 LTE-Advanced that's being sold in Korea, that is supporting their VoLTE network, and tell me if you've ever seen them advertising any "Dual MIMO" nonsense. Also look at their filings for that phone, and you'll realize that antenna setup is exactly the same as any other LTE phone, including Moto X.
OK. At this point I know that your ether a troll or a retard. I am done. I have given you all of the material you need to understand Dual LTE MIMO Antennas and why they are needed. If you did not read it or understand it, it is all you fault. And NO. No 4G LTE phones (with the exception of the GS4 I9506) have more than 1 LTE antenna. The cell phones of today have 4 antennas; 1 LTE, 1 CDMA/GSM, 1 Wifi, and 1 Bluetooth. That's it nothing more. This phone (if the rumors are true) would come with 5 antennas; 2 LTE (Dual LTE MIMO Antenna), 1 CDMA/GSM, 1 Wifi, and 1 Bluetooth. GO TROLL SOMEWHERE ELSE! Oh we resort to name calling?! Oh how helpless. Anyhow, let's take a look on some obvious examples from recent FCC filings all with multiple LTE antennas: GS3 LTE, chapter 1.3: apps.fcc.gov/eas/GetApplicationAttachment.html?id=​1910663 GS4: droid-life.com/2013/03/29/verizons-samsung-galaxy-​s4-cruises-through-fcc-wonder-when-theyll-acknowle​dge-it/ You get my point. Feel free to visit FCC site and educate yourself. This can't be real. 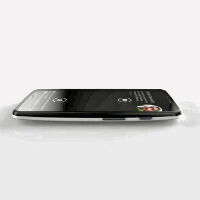 I don't believe in the phone customization part and we've already seen photos of the dotted plastic back of the Moto X. How awesome would it be if those photos and old rumored specs were just elaborate decoys, and Moto just blew us away with something totally next-gen? I mean, the price of the thing would skyrocket, but even so... Maybe they could make two! It would seem that Magic Glass is Moto's term for flexible display. I wonder who is supplying the flexible display? Sammy teased us with their version of flexible display early in the year but ultimately kept it back. Perhaps Corning is not as bashful? Indeed it is. What I would really like to see now is price and battery life info. Other than that I thank that this might be my neXt device. I was personally hoping for a $200 off contract price but from the leaks Ive seen It looks like it might be $299 which is still not bad. The one thing that is missing that would make this the perfect device is the micro SD card reader. Just a few more days until the most well rounded Android phone gets launched. I just really hope it doesn't just have the S4 Pro, but Motorola's X8 custom chip. 4.5-4.7" 720p display 2 GB RAM Motorola X8 chipset Stock Android looks with a few extra great features Near instant updates All for $300 for the 16 GB variant. I'll pick up mine in white with a grey spine and white Kevlar back. Is picture #2 of a REMOVABLE battery? The only reason for phone manufacturers' to make embedded batteries is to force customers to BUY a new phone when the battery dies...And for companies that make their phones Non-removable, they should at least make those phones IP57 or IP58 Waterproof -certified! Sorry Typo: "...that make their BATTERIES Non-removable,..."
Well, it might not have a removable battery. The back cover will be removable so you can swap it for one with a different color and/or material, but whether the battery will be accessible remains to be seen. Motorola's been using unibody designs without battery access for a while, so I would understand if they wouldn't include it now.